FastCompany details: The Gulf oil disaster has been quelled, at least on the surface. But what happens now to all the plastic boom material that sopped up BP’s spilled oil? GM’s solution: stick it under the hood of new Chevy Volts. 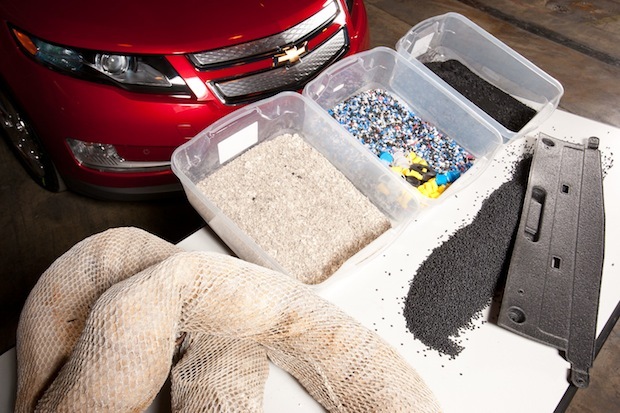 The auto giant has devised a way to turn oil-soaked plastic boom into plastic resin that that can be used for under-the-hood parts in the recently released extended range electric Volt. GM didn’t figure out how to convert boom to car parts alone. Heritage Environmental is collecting the used boom, Mobile Fluid Recovery is eliminating absorbed oil and water with a high-speed drum that spins the booms until they are dry, Lucent Polymers is making the material appropriate for plastic die-mold production, and GDC Inc. is combining the plastic resin with other plastic compounds to make the car components. The end product is a set of parts (25 percent boom material, 25 percent recycled tires) used to deflect air around the Volt’s radiator. GM will continue to use booms until the recovery process is completed, in approximately two months. Ultimately, the company estimates that its work will result in the upcycling of 100 miles of boom from the Alabama and Louisiana coasts–and produce over 100,000 pounds of plastic resin for Volt components. The initiative is a boon to the environment, and a clever marketing move for the Volt, which has an all-electric range of approximately 40 miles. It’s also a reminder that the Gulf oil disaster cleanup is not even close to done.